Who doesn’t love brunch!? My husband and I had a brunch wedding reception, if that tells you how we feel about it. But weekend brunch in general is such a yummy treat. What I love about brunch at home is that you can dress it up or down to your taste. We recently had some friends over for a casual brunch meal. I wanted it to feel casual, because it was a cozy afternoon at home, yet elevated, because I enjoy making my guests feel special. Of course, I was so busy trying to time everything in the oven just right that I didn’t get any photos of the final food spread! When I entertain, I always like to ask about food allergies/sensitivities and if anyone in the party is vegetarian, etc. A good brunch involves savory, sweet, and something fresh, so my menu consisted of quiche, crispy bacon, fresh fruit, banana bread muffins and a green salad. Brunch menus are usually of the breakfast variety, so I like to add a salad to incorporate the lunch aspect. I also set up a little coffee bar with extra K-cups, mugs, cream, sugar and stirrers so that my guests could help themselves. This is when I can break out my little china creamers and such that never get used but are so charming and sweet. The florals came from Whole Foods and were a pre-arranged bouquet that I snipped down to size for the vase I wanted to use. I think it’s important to keep your centerpieces below or just below eye level so that no one is talking through them. Otherwise, you just end up moving them out of the way and defeating the purpose of a lovely centerpiece that pulls the whole table together. I just loved the spring color combination in this one and they really brightened up the afternoon. I was excited to put my Pottery Barn Tava Chargers to use for the first time since purchasing them. They looked so crisp next to my Pottery Barn Emma Dinnerware. 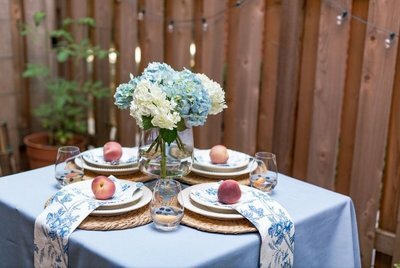 If you wanted to go really casual, you could swap out the linen napkins and dinner plates for paper ones, but I think those elements along with the flowers are what elevated it. How easy to swap them in for a more sophisticated setting! I hope I’ve inspired you to host your own cozy (yet elevated) brunch at home this spring!